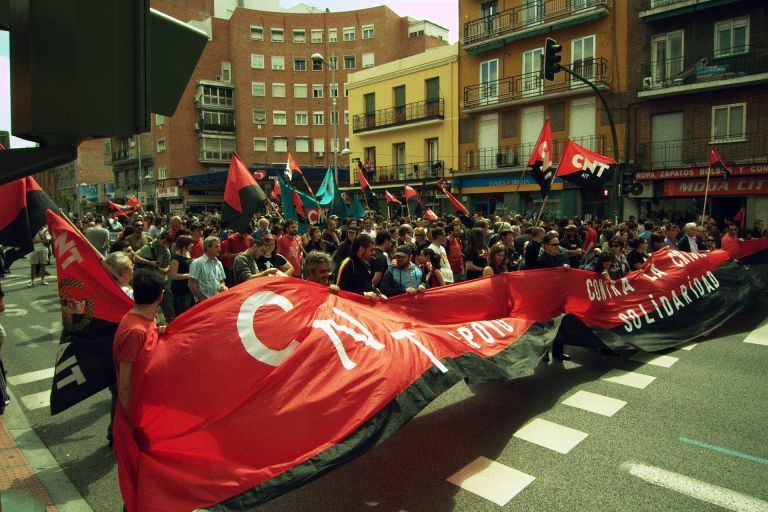 Considering the relative weakness of anarcho-syndicalism in Britain historially, Philip Holgate compares three countries where the revolutionary union idea took off and made a major social impact in Spain, Sweden and the US. Holgate, born at Chesterfield, 1934, studied mathematics at Exeter and spent five years teaching in a progressive school. He was a member of the London Anarchist Group and the Freedom Press Group. This article was first published in Anarchy Number 2, April 1961. ANARCHO-SYNDICALISM HAS BEEN DESCRIBED as the application of anarchistic ideas to industrial problems. Its basic ideas, described in innumerable pamphlets and in Rudolf Rocker’s book, are that working-class organisations should be completely independent of politics; that their structure should be federal and non-bureaucratic; and that they should fight capitalism and the state without compromise, aiming to replace them by a free society based on co-operation. The workers have not generally responded to syndicalist propaganda, and the unions based on it have been too small to play an important part in industrial affairs. However, in some countries conditions have made it possible for syndicalism to develop on a significant scale. The purpose of this article is to look at this development in three such countries, under widely different conditions, and to try to discover to what extent syndicalist ideas were borne out, and to suggest the lessons that these experiences have for libertarian industrial movements today. Syndicalism in Spain dates back to 1868, when Mikhail Bakunin‘s comrade Fanelli made a propaganda visit. His message was enthusiastically received. Spain is a country of varied cultures and several languages. Federalism was even then a respectable idea, and this, united with the workers’ and peasants’ desire for social revolution, was the very situation in which Bakunin’s ideas took root and flourished. A section of the First International was formed as a result, and it remained almost unanimously faithful to the anti-political point of view when the International broke up. Since then there has always been a syndicalist movement in Spain, either openly or underground, and in 1911 it crystallised in the foundation of the Confederacion Nacional del Trabajo (CNT) at the Congress of Bellas Artes in Barcelona, by representatives of 30,000 workers. The strength of the CNT increased rapidly, so that on the eve of revolution in 1936 it counted on a million enrolled members. Several suggestions have been made to account for the success of a revolutionary ideology which was relatively ignored elsewhere. In addition to the federalist tradition, which was just as unfavourable to socialism as it was disposed to anti-governmental syndicalism, there was a tradition of direct action. At every peasant rising in the 19th and 20th centuries the demand had been for a sharing out of the land. The peasants had a deep conviction that if only they were left alone to farm their land and reorganise their villages, all would be well. They could see the local part of their problems, and could not see what relevance Madrid politics had to them. Brenan has suggested that anarchism in Spain has been analogous to protestantism in the rest of Europe; a movement of reason against the church. While this is a dubious theory, there is certainly an ethical content to Spanish anarchism which marks it off clearly from any other political movement. The un-philosophical working-class conviction that you can always tell right from wrong shows itself in millions of ordinary Spaniards concluding that the State and capitalism are wrong; a fact which seems so difficult for many people of supposedly better education. Sweden had no long-standing libertarian tradition similar to that of Spain. As in many European countries, social democracy and anarchism developed side by side within the same organisations, and it was not until the turn of the century when the socialists were clearly within sight of parliamentary influence, that the theoretical differences between the two currents led to expulsions and splits. The Young Socialists, who developed into the continuing anarchist movement, began to go their own way from about 1893. The year 1909 saw a general strike throughout the country, which ended in crushing defeat for the workers. The Lands Organisation (LO) had led the movement with characteristic half-heartedness, and as a result of the demoralisation following the defeat its membership was halved from 161,000 to 80,000. In response, timber workers in the “red” province of Skaane got together in a committee, and in 1910 the foundation Congress of Sveriges Arbetares Central organisation (SAC) was held in Stockholm. It had 696 members to begin with, but developed rapidly, to a membership of 4,500 in 1914, 20,000 in 1818 and 32,000 in 1920. The Industrial Workers of the World was founded in 1905. Despite its name, and small groups of members in many countries, it has always been a predominantly US organisation. When it was founded the American labour scene was occupied by the AFL, which was a federation of craft unions, and numerous petty unions which spent their energy scrapping among themselves, engaging in legal disputes and organised scabbing, and providing a happy hunting ground for racketeers and power seekers. The fact that syndicalist organisations developed in three countries where the national temperaments are so different, and the problems of industrial organisation so varied, counts against the theory that revolutionary syndicalism is only suited to Iberians. It also challenges us to find out why syndicalism rose to be a significant movement in some countries, but not in others with apparently similar conditions. Why did the SAC grow in Sweden, but nothing on the same scale develop in Norway? Why was the Italian Syndicalist Union always numerically smaller than its rivals, while the CNT was far superior? There is possibly a loophole for the answer, long buried under determinist ideology, that the success of an idea depends on the vigour with which it is propagated. Certainly, the specifically anarchist minorities played a major part in getting the syndicalist unions going in Spain and Sweden. Looking for common features in the early years of the three organisations, we find that two of them, IWW and SAC were founded as a direct response to the failures of orthodox and politically-inclined trade unionism, a factor which is still present in the more comfortable conditions of today. All the organisations found themselves immediately involved in bitter industrial disputes throughout the area in which they operated. In 1913 when the S.A.C. had only 3,709 members they were involved in 30 strikes. They took part in 80 strikes in 1916; 172 in 1917 and 262 in 1918. In 1923 9,000 of its members took part in strikes in the forestry industry alone. The local strikes in Spain had a more revolutionary character, as the workers often made demands so high that they could only have been achieved by a social revolution. A wave went through Spain in 1905, in which peasants demanded the division of the big agricultural estates. These disputes were often directed against inhuman conditions of work, and sometimes secured the doubling of wages. The IWW and all the unions claim that the overwhelming majority of these resulted either in victory for the workers or compromises favourable to them. The biggest strike of the period in America was undertaken by the textile workers of Lawrence, where the whole labour force of 25,000 came out in 1909 and after ten weeks of police violence won a substantial wage increase. The culmination of CNT militancy during the period was the strike against the Canadiense, the electrical company of Barcelona, which involved 100,000 workers. It was clear that for this type of activity, where direct action by small concentrations of workers against their respective bosses was the predominating form of industrial conflict, syndicalism was what the workers had been looking for. The ability of the syndicalists to face up to violent attacks from the State and bosses is another feature common to them. The CNT was declared illegal almost as soon as it was founded, and has been frequently forced underground since. It was subjected to actual assassination of its militants by police agents, as was the IWW Police charges against workers’ meetings, shootings, arrest and imprisonment of officials and prohibitions of activities were the lot of all syndicalists, and their ideas and organisation made them better prepared to meet this than the socialists. The central feature of the structure of these organisations was their decentralism. They were composed of workshop branches federated into local federations, and these would in turn link up in regional and national federations. The local branches in each industry also federated to form industrial unions, an important pillar of the IWW but one which was not introduced into the CNT until 1929. It may be objected that this structure corresponds exactly with that of say, British trade unionism, but the difference is that in the syndicalist unions the power rested with the local groups, and they exercised it. Linked with their decentralism the syndicalists had a mistrust of paid officials. Propaganda in the early days was carried out by dedicated militants who would be supported by comrades in the districts where they were working. Even when its membership was in the region of a million the CNT only employed one full-time secretary. It is also part of syndicalist theory that members of committees should be ordinary workers, elected to fulfill specific tasks, and subject to immediate recall. While this is an ideal which is most difficult to keep to in practice, because of the way in which revolutionary mass organisations tend to throw up oligarchies and influential minorities, it did check the tendency for elites to develop, and in the IWW and SAC cases ensured the virility of the organisations even when they were numerically overwhelmed. The organisational factors mentioned above are natural consequences of the fundamental assertion of syndicalism. That is that the enemy behind capitalism is the State, and that working-class struggles should not be waged through parliamentary and governmental channels, but must be directed against them, and aim to replace the oppressive State by a free federation of producers in a free co-operative community. The theory and practice of the syndicalists then were united in stressing the value of direct action. While unions throughout the world were using direct action as an alternative to constitutional methods, the revolutionaries, being prepared for it, were consistently more effective. Their attitudes to parliament varied. The CNT was most strongly inspired by an anarchist opposition to government as such. During the 1933 elections it carried out a determined anti-electoral campaign. culminating in a mass meeting in Barcelona where the slogan “In place of the ballot-box, the social revolution!” was put forward, and they declared that if abstention resulted in a victory for the right, they would launch the social revolution. In 1936, as a result of compromises with political elements. the anti-electoral campaign was hardly noticeable. The other two organisations were not so strongly influenced by pure anarchism, and their opposition to parliament derived more from the fact that democratic methods corrupted working-class militants and organisations. It is important to remember that whatever the views of the organisations were about parliament, they included in their ranks supporters of every political view from anarchists to members of the Socialist Party. Syndicalism had its most notable successes when it was fighting against a decentralised enemy, in a period when the unstable nature of industrial conditions paralleled the unstable aspects of revolutionary organisation. The weaknesses of these were as apparent as their advantages. Accounts of the wildly hopeful local risings in Spain, where the anarchists in a small village would proclaim libertarian communism, and the end of money, property and exploitation, only to be bloodily repressed by assault police a day later make tragic reading. On occasion too, a strike would fail because only one region supported it, while the others who were not in favour, stayed at work. The wildly fluctuating memberships of the syndicalist unions was a great source of weakness. The SAC had had 200,000 workers pass through its books of which most only remained members for short periods. After the successful strike at Lawrence in 1909, 10,000 workers joined the IWW local. In 1913 its membership had dropped, to 700. Generally, the IWW was enthusiastic about numbers, and this led it to underestimate the fact that paper membership is not a good guide to revolutionary strength. One of the worst errors the CNT made during its early period was to imagine that its membership could be relied on to support radical action, when in fact about one in ten was personally convinced of syndicalist objectives. Capitalism, the State, and trade unionism have developed considerably since the days when syndicalism was developed, in theory and practice. This is most noticeable in the Swedish welfare state and the managerial society in America, and least in Spain. The problem facing syndicalism was how to respond to this development, so as to preserve its essential objectives, yet be able to carry on the struggles called for by contemporary events. The peak year for the SAC was 1924 with a membership of 37,336. After 1933 a gradual decline set in with membership falling from year to year. The IWW had several peaks, and had different degrees of success in different industries. It had one peak just before the first war and another in the early twenties. Outside of Spain then, the history of revolutionary syndicalism has been one of rise and decline. Before examining the external factors which affected this, it is worth examining some of the internal difficulties of syndicalist ideas and organisations. It is inspired by anarchist and libertarian ideas which call for a high degree of personal conviction, yet it sets out to be a mass movement. In order to preserve its specific nature it should only admit to membership applicants who subscribe to its point of view, but in order to be effective it needs the support of all the workers. By basing itself on a distinct minority principle it introduces a division into the working-class movement, yet one of its aims is the unity of the proletariat. The fact that syndicalism has been relatively ignored in most of Europe, and has been scorned by many anarchists may be because these contradictions have been too much to face. The anarchists of Spain and Portugal set up the Federacion Anarquista Iberica (FAI) in 1918. Its members had to belong to the CNT which they regarded as their special field of action. Not all the anarchists belonged to it, as some felt that this committal to the CNT involved a sacrifice of the universal appeal of the anarchist philosophy. The membership of the FAI has been estimated at 10,000. The rest of the membership of the CNT contained a certain proportion who personally agreed with the revolutionary syndicalist point of view. It also contained workers who joined it because it was the strongest union in their locality, or because of its obvious vigour in fighting disputes. Furthermore, these are very good reasons for joining a union, and particularly one in which action was regarded so highly in comparison to words. The dangers inherent in such a situation were almost all realised in practice. It became plausible for reformist “leaders” to rise up and denounce the extremist “leaders” for sacrificing the immediate needs of the members by their “doctrinaire” policy. Such a movement against the alleged dictatorship of the anarchists was a constant feature of internal CNT politics. The anarchists, in reply, found themselves devoting much of their energy to preserving the doctrinal purity of an organisation, many of whose passive members did not accept it, and it has been suggested that this deprived Spanish anarchism of its chance to play a really independent role in the social affairs of the time. When anarchists play such a part in a larger union they become involved in the importance of getting elected to this or that committee, of disputing the precise interpretation of documents and so on; the very features of political life that lead them to reject the reformist programme of freedom through government. In practice, all the prominent Spanish anarchists occupied leading positions in the CNT, and later on found it impossible to act as anarchists during the crisis of the revolution. Image: CNT general secretary Horacio Martínez Prieto, who arranged for the CNT to enter the Republican government in 1936. In Sweden, the founding of the SAC was accompanied by a weakening of the Young Socialist movement, as many of its prominent and active members gave up all their other activities and concentrated on syndicalism. This did not, unfortunately, prevent the eventual rejection of revolutionary syndicalism by the SAC The case of the IWW is different. This union had suffered badly from the machinations of Marxist socialists during its early years, and developed an anti-political attitude which even made sure that anarchists did not have too much influence in its councils! The tendency of capitalism to become centralised was met by putting more emphasis on the national industrial unions. This however was the cause of a split in the IWW in 1924, which resulted in “most members dropping out in the middle” and was a hard blow. At the 1929 CNT Congress too, some delegates opposed the national industrial unions on the grounds that they departed from the anti-centralist spirit of the Confederation. Another feature of syndicalist tactics which could not be retained was the opposition to any form of wage agreement, binding for a fixed period of time. The SAC had specifically declared against such agreements in its declaration of principles, and had proposed instead a “permanent state of war in the social field”. When conditions of work are physically brutal, and open war is being waged on both sides, the revolutionary position has a natural appeal, which it unfortunately seems to lose when the employers feel safe and prosperous enough to bargain with unions, and the State realises that its interest lies in arbitrating between employers and workers rather than in attempting the brutal repression of the latter. Since there was a much stronger social democratic union in Sweden which did treat in terms of agreements the SAC found itself pushed towards this position in order not to be at a disadvantage. This was in spite of the fact that official statistics showed for instance that forestry workers wages in the areas organised by the SAC were consistently much higher than those where LO agreements were in force. As happens so often, the bad organisational ideas drove out the good, and at the SAC’s 1929 Congress, industrial syndicates were given the option of signing binding agreements, and the 1938 Congress asserted that while the organisation somehow or other stood by its principled position, it would consider binding agreements and accept the responsibilities they implied, in practice. The evolution of the IWW on this question was parallel. On the one hand, the desire to keep a syndicalist organisation on the right road has led to splits in the movement, and on the other hand desire for working-class unity has led them to seek agreements or amalgamation with other organisations. The split in the IWW in 1924 has been mentioned. It was never an attractive take-over proposition. The SAC suffered a split in 1929 when most of its locals in the South West broke away to form the Syndicalistiska Arbetarefederation (SAF). This organisation stood for a more uncompromising position, at a time when intransigence was becoming increasingly unpopular, and it made no progress. In 1938 its residue re-amalgamated with the SAC From 1928 a committee of the SAC and LO sat to determine a basis on which the two organisations could get together. In 1929 the executive of the SAC agreed to this with only two opposing members. The basis for union was a document affirming that both organisations were based on the socialist class struggle, that they both aimed at the replacement of capitalism by a co-operative democracy, and that they were opposed to militarism and war. When this proposal was placed before the members it was decisively thrown out. For once, the rank and file of a union had saved it from a sell-out, and had recognised what their leaders were indifferent to, that the socialist paper declarations of revolutionary intentions meant nothing in practice. These activities in Spain were all being carried out under the shadow of fascism and in the hopes of a social revolutionary response to it, and they need far fuller discussion than is possible here. In attempting to draw up a balance sheet for syndicalism it is inevitable that most of the praise or criticism will also fall on the heads of anarchists, for without the determined action and theoretical conviction of men holding anarchist or related views the syndicalist organisations would neither have come into existence nor remained. However, the anarchists were acting in an atmosphere that was limited, and while it has been asserted that the industrial syndicate is the place where anarchists should be active, it has not been shown that anarchists are most successful when trying to provide leadership for a mass movement. The most effective way for anarchists, or people convinced of the rightness of syndicalist ideals to help a union to keep them as its inspiration, is to be at the same time independent and committed. This is a difficult position, as it throws them into the position of critics from the outside if they are not careful, but the problems which it raises are soluble within the anarchist frame of reference, while the problems of anarchists in positions of power, of the situation where they are denying others the right to adopt non-anarchist resolutions, and issuing manifestos in the name of thousands who have never seen them are not. With capitalism developing towards a more centralised and stable structure, and the evolution of the modern State and the trade unions, the problems facing the workers have become broader and more complex. The syndicalists reacted to this in very different ways. The IWW, perhaps because of its early quarrels with the Socialist Labour Party, had declined to take up a not directly related to on the job organisation and class struggle. Even when it was itself engaged in a series of “Free Speech” fights in areas where its activities had been banned by the police, there was disquiet in case concentration on the freedom aspect of the case should divert the attention of militants from their factory and lumber camp organisation. A similar suspicion fell on anti-militarist propaganda during the first world war. One IWW leaflet showed all other radical tendencies pointing to the stars, while the IWW figure pointed to the factories and said “organize”. It was part of their theory that as the workers became more independent and self-respecting their revolutionary consciousness would rise, and that success in day-to-day direct action would lead them straight to the social revolution. That is where syndicalist theory has broken down most conspicuously. After winning striking victories in bitter struggles using direct action the workers have not profited by their experience and extended the class war until final victory, as the syndicalists hoped they would. The bosses and the State have profited far more from their experience and have modified the economic structure of society so that the conditions in which syndicalism flourished no longer prevail. This means that if a workers’ organisation is to be effective it must take up attitudes, as an organisation, on all sorts of questions which did not come into the field of interest of the pioneers of revolutionary syndicalism. It is this need to change from a fighting organisation engaged in localised and short-lived struggles, to a movement of opposition opinion which has been the hurdle on which the IWW and SAC have been caught. The IWW stuck to its traditional narrow field and declined to insignificance, while the SAC, finding at last that the pressure of the inactive card holders did not allow it to take up a conscious revolutionary position on issues such as the war crisis and the welfare state, slid into a position in which it is barely distinguishable from the LO which it was formed to replace. It has been easy for anarchists to attack the reformists in the SAC, but they were trying to find some solution to the problem of a revolutionary organisation in a situation unfavourable to revolution. In the welfare state of today there are growing signs of revolt against the new, milder forms of oppression that it involves. The twin aims of the syndicalists of the past were effectiveness in the day-to-day struggle, and through it, the introduction of a libertarian communist society. They were remarkably successful in their first objective, but have not made any real progress with the second. The workers’ movements of the future will have to fight different kinds of battles; against bureaucracy, affluent complacency and working-class bosses as well as against employers. They may be put in the position where they appear to be biting all the hands that feed them. They will therefore need far more social understanding than ever before, and the merits of mass organisations will be more doubtful. It should also be more clear that the building of a free society does not automatically follow the destruction of the old one. In short, the most necessary development for a future workers’ movement is not so much a revival of the old syndicalism, as the development and spread of anarchism. Next post: #Portland: Solidarity with Patriot Prayer Counter Protesters and Resisters!